The rains are destroying the cotton crop from all sides. 2017 was supposed to be a banner year for cotton. Not anymore. Photography Matthew Nichols on Flickr. Predicted at 20.5 million bales, this season’s cotton crop, if it had achieved that, would have been the largest in more than a decade. It would have been a 3.4 million bale advantage over last year – more than a 20 percent increase. But Texas happens to be the biggest cotton producing state in the country, and Texas is not having a good August. Hurricane Harvey’s wrath has been enormous: 13 lives lost (so far), billions of dollars in flood damages, countless homes destroyed. But the storm hasn’t just affected urban and suburban areas; the delicate agricultural land in Corpus Christi, 200 miles from Houston, is the second-largest cotton-producing region in Texas, and it’s being hit hard. The hurricane has affected the cotton crop in a few different ways. Seeing the incoming storm, cotton farmers rushed to harvest anything in their fields even though it wouldn’t normally be harvested for weeks. Any cotton left has likely been destroyed by the pounding rain and flooding. An analyst Fox Business spoke to estimated that that loss could be as high as 200,000 to 300,000 bales’ worth. But the bigger problem is whether the cotton that’s already been harvested and baled will survive the storm. It’s standard practice to leave the enormous bales of cotton in the fields until they’re ready for processing, even in a storm like this; some of those fields were inundated in up to four feet of standing water. Even the bales that were put in storage facilities may be at risk; tthese facilities aren’t designed to handle rain of this magnitude (though maybe they should be, this is the third 500-year flood to hit the area in as many years). Cotton that’s been extremely damaged, if it’s salable at all, would have to be marked as “salvage,” and sold at a loss. 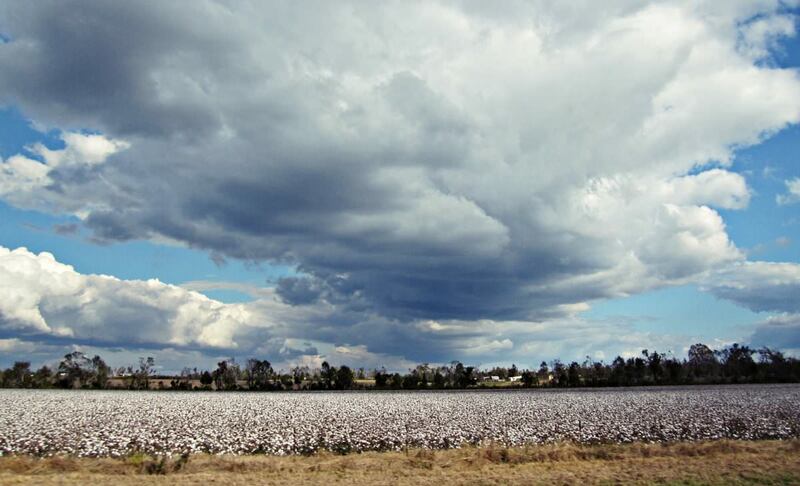 It’s not clear yet exactly how much damage Harvey has done – to the crops and otherwise – but it’s safe to say that this is going to be far from the amazing yield cotton farmers have been hoping for.